The D.C. establishment is wailing hysterically over the prospect of President Donald Trump refusing to instigate Cold War II so desired by the elite. But does the potential loss of control by the War Party warrant the Beltway elite’s accusations of treason against our commander-in-chief and even apparent calls for a military coup? Trump’s refusal to challenge Vladimir Putin’s claim at Helsinki—that his GRU boys did not hack Hillary Clinton’s campaign—has been called treason, a refusal to do his sworn duty to protect and defend the United States, by a former director of the CIA. Available from AFP Online Store. Yet, should he attempt to carry out his agenda—to get out of Syria, pull troops out of Germany, take a second look at NATO’s Article 5 commitment to go to war for 29 nations, some of which, like Montenegro, most Americans have never heard of—he is headed for the most brutal battle of his presidency. By cheering Brexit, dissing the EU, suggesting NATO is obsolete, departing Syria, trying to get on with Putin, Trump is threatening the entire U.S. foreign policy establishment with what it fears most—irrelevance. Buchanan is a writer, political commentator and presidential candidate. He is the author of Nixon’s White House Wars: The Battles That Made and Broke a President and Divided America Forever and previous titles including The Greatest Comeback: How Richard Nixon Rose From Defeat to Create the New Majority. Both are available from the AFP Online Store. 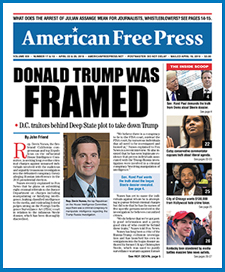 I am an old republican and conservative but strongly believe in a free press. If there is nothing to be concerned about, why does he tweet his anger so often?? If you believe in Freedom of the press, why support his Nazi like attitude. That’s what happened in the 1930’s vilify the press and control the nation. Are you not concerned about that ?? ?